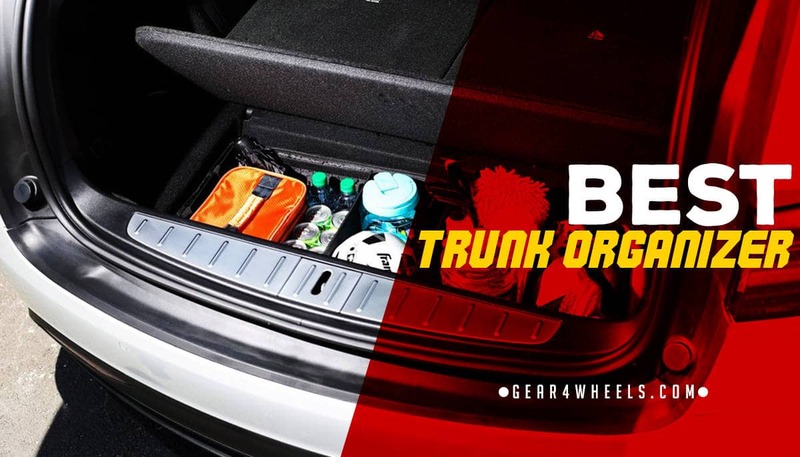 Trunk organizers are an ideal way to prevent items from rolling around in your trunk when driving, particularly those that are liable to break or potentially cause damage to your car interior. They come in a range of sizes, with various means of installation, and can have anywhere from 1 or 2, to 6 or even more compartments. Below, we’ve detailed 5 of the top organizers available right now. 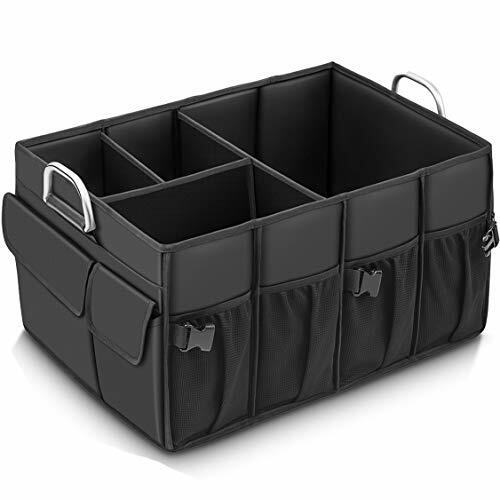 Tidy Globe Premium Heavy Duty Organizer. The MIU COLOR Foldable Cargo Trunk Organizer comes in just one color, despite the name: black. However, it is still a highly attractive product, built from sturdy materials and strong compartment dividers. Though more expensive than some other competitors we’ve listed here, the build quality is also better. 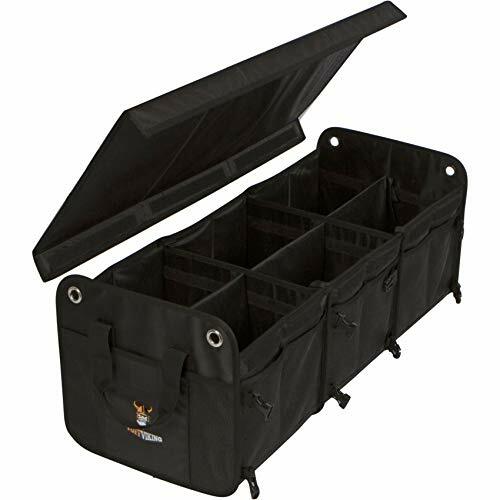 Aside from the 4 main storage compartments, this organizer features a range of exterior pockets (3) with zippers and Velcro, as well as strong aluminum handles that can carry a lot of load when removing the storage unit from the trunk of your car. The compartments are large and sturdy on this organizer. Not only are they very deep, with plenty of room for larger objects such as liquid-filled bottles, but they are also held in place by very strong Velcro connectors. 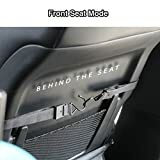 This prevents the compartments from detaching and moving around. When opening the packaging, your first impression may be that the product is in fact smaller than it appears in pictures. When placed into a large vehicle trunk, it doesn’t often completely fill up the compartment. On the flipside, when placed into a smaller car, the lid tends to hit the roof of the trunk, unless you pull the organizer forward, first. The Tuff Viking storage organizer comes in 2 distinct colors, with a reasonable storage capacity and broad range of pockets. It's at the higher end of the budget and is perfect in size for larger vehicles such as SUVs and trucks. This organizer comes with a free drawstring bag, which is ideal for carrying soiled clothing or footwear after outdoor activities; perfect for keeping your organizer free from dirt and grime. It's also supplemented by a vast range of 11 pockets that extend storage beyond the interior compartments. 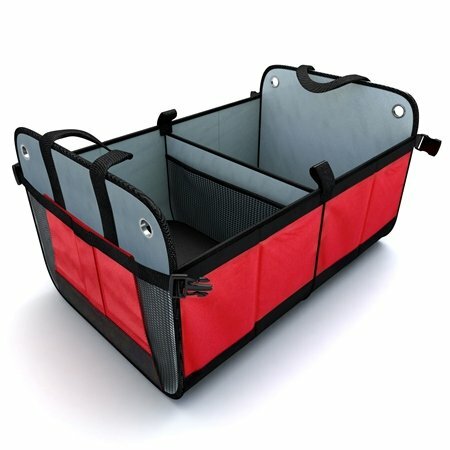 With its variety of straps and handles, as well as the buckles used to keep the bag held together, this storage organizer can easily be removed from your trunk and carried around for offloading shopping. When not in use, it collapses either halfway, or completely, fitting into a small space within your car for future use. Though the straps are useful for carrying the container, they cannot be shortened so they won’t be quite so suitable for everyone. The anchoring system is also not ideal for every size vehicles. The only other negative point worth mentioning is that the product smells strongly of plastic when first opened; it’s worth airing out the organizer before beginning to use it. 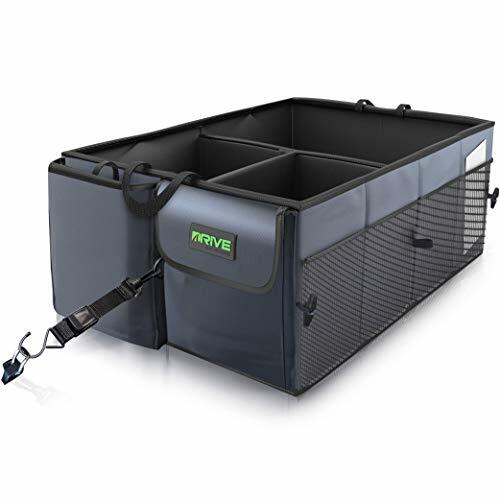 This is a large vehicle organizer unit produced by a popular brand, Drive Auto, which features Patent Pending designs. It's one of the cheaper models on the market with three optional colors: black, tan, and original gray. Lots of the storage space in this organizer is found on the exterior, with a vast total of 10 different pockets. Cables can also be used to secure this organizer unit in place while driving, so that it does not slip around the trunk. This is a stylish bag with lots of detailing, including additional edging on the main points of wear that helps to increase durability. There are 3 compartments inside, but storage space is extended by 2 exterior pockets with space for additional accessories. This bag has the common issue with new products in that it smells strongly of plastic when first unpackaged. In terms of its design, there is room to make the exterior 2 pockets larger, and the clasps used to secure the straps when driving get open quite easily. Price-wise, this is a mid-range organizer with limited internal compartments, but it has other notable advantages that bring it onto our list of top storage units for the car. It's ideal for SUVs, cars, trucks, or minivans owed to its generous size. This is one heavy and durable bag, reinforced to handle that extra load with a triple-reinforced polyester body and strong, thick nylon handles. The fabric used is thicker than ballistic nylon and the product is backed up with a lifetime warranty. This bag is built from highly durable materials, including rubber, nylon, and other strong fabrics. Although this increases the carrying weight of the empty bag itself, it adds exceptional durability and support to the bag, which holds its shape well. That said, the bag still has a very small footprint once collapsed down. These bags come with just 2 main compartments, which is few compared to other products; additionally, the middle divider cannot be moved, making the internal storage quite restrictive. The material used for the external base is also not ideal, as it doesn’t have non-slip properties, meaning it has the potential to move around in your trunk when driving. 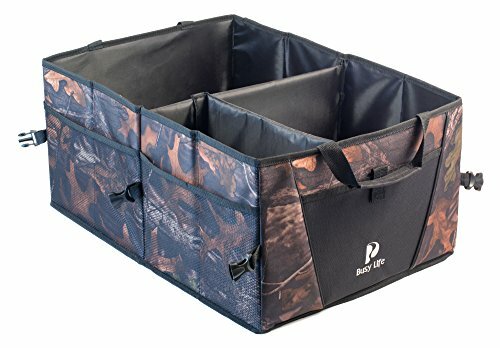 The Busy Life storage unit is an SUV-grade organizer that has a ton of storage space. Price-wise, it's at the lower end of the budget range, with only one color option. It lacks any belts or buckles for securing to the trunk but is large and heavy enough to stay put when full. 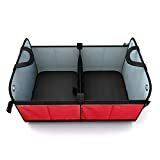 This organizer comes equipped with 2 free reusable grocery bags, which can be inserted into the compartments for better stability when packing, and easy removal for shopping or at home. Clasps around the exterior fasten to keep the bag compact when collapsed either halfway or completely. Whereas many storage units can be collapsed when not in use, this one can be half-collapsed; this means using half of the compartments when needed, while retaining space in the trunk for larger items. The compartments are very deep, too, meaning lots of room for storage. One of the problems with this storage unit is that the compartment dividers can be easily deformed if they’re only loosely packed and have heavy items pressing against them when in transit. Coupled with weak Velcro strips, the compartments don’t always retain their shape well. The rigid panels on the base could also be easily stained and degrade, due to the materials used. Based on all the products that we’ve examined, our best in class is the MIU COLOR storage organizer. This product features some of the strongest Velcro and dividers that we’ve found, which means they won’t fall apart or deform over time, keeping your items separated properly. The storage compartments are also extremely deep, with plenty of space for items that need to remain upright.